The role played by travel agencies is an important aspect of Turkey's growth in the tourism sector. Today in Turkey there are 4,056 head agencies and 1,334 branches for a total number of 5,390 agencies. The American Society of Travel Agents' General Congress, to be held in 2010, will take place Istanbul under the sponsorship of the Turkish Culture and Tourism Ministry, with 3,000 participants expected. How important is the role of travel agencies in improving the Turkish tourism sector? When you compare the strength and effectiveness of TÜRSAB with other travel agency organizations in countries that compete with Turkey in the tourism industry, what sort of picture emerges? Travel agencies have always played a fundamental role in the development of Turkish tourism and always will. In order to work as a travel agency in Turkey, one must be a member of the Turkish Travel Agencies' Union (TÜRSAB) and must obtain a license to practice from the Turkish Culture and Tourism Ministry. In Turkey today there are 4,056 centers and 1,334 branches of what is altogether 5,390 agencies. TÜRSAB is, without exception, the only professional union representing all travel agencies in Turkey. In a country such as the US where only 5 percent of the population has a passport, what would you like to say to less well-traveled Americans in order to attract them to Turkey? How can the desire to spend 10-11 hours on a flight or days on a cruise be instilled in an American? What is Turkey's significance in the cruise travel sector? Cruise travel constitutes a large number of long-distance destinations in the tourism industry. Cruises increase interest in trips such as an Istanbul, Kuşadası – Ephesus – Selçuk – Mother Mary's House program. Without a doubt the American tourists who visit Turkey via cruise ships comprise a sizable percentage of the total tourists from the US. On which type of tourist activities do American tourists in Turkey place the greatest importance? Travel, fun, and culture rank high on the list of activities in which American tourists in Turkey are interested. Motivating potential tourists in these areas and increasing interest in our country involve a couple of things, such as identifying targeted market segments, creating Turkey's image as a tourist destination so that our country is correctly perceived abroad, and collecting better data on our tourists' values and desires. What do you think about promoting Istanbul primarily as a brand? Istanbul is important in terms of zeroing in on a certain tourist segment by emphasizing its role as an alluring world capital, as a carrier of Turkey's cultural history and riches, and for its strategic potential for religious tourism and special interest tourism. For example, Istanbul not only has the remnants of three empires, but also has the historically exotic Grand Bazaar, Europe's most modern airport situated within a land of historical and original cultural riches, the most modern shopping centers, 5-star hotels nestled within the stunning panorama of Istanbul, and a colorful nightlife; all these aspects of Istanbul must be emphasized. This is in addition to the three religious traditions that have co-existed for hundreds of years, an attractive feature for religious tourists, and other types of tourism as well, such as eco-tourism, botanical tours, cultural tourism, etc. These are all different types of tourism that could appeal to various types of travelers. In terms of the sharp decrease in American tourists after September 11th, what needs to be done in the coming years and what types of strategies should be implemented? How is TÜRSAB involved in these efforts? Although the September 11 crisis brought about a steep drop in American tourists visiting Turkey, since 2004 we have seen a rapid increase in those tourists. The numbers of American tourists visiting Turkey has shown a gradual increase. In the January – November time period of 2007, the number of American citizens who visited Turkey increased 21.95% from the year before and its number reached 628,881. However, upon examining the potential figures, we think that this number falls well short of what should be the numbers for Turkey's tourism trade. For several years we engaged in attempts to bring the annual congress of the American Society of Travel Agents (ASTA) to Istanbul. The 2010 ASTA General Congress, expected to attract 3,000 participants, will take place in Istanbul under the patronage of the Turkish Culture and Tourism Ministry. We expect that this important event will help accelerate tourism from the US to Turkey. We think that by getting to know Turkey better, the American travel agencies will be positively affected and that that will affect demand for travel to Turkey. Today in the US, Las Vegas has established itself as a leader in convention tourism, Miami has its sun and sand, and North Carolina is a haven for those wanting to spend their vacation golfing. In order to create a differentiation within Turkey's tourism sector, what specific concepts are being developed or need to be developed in the coming years? Istanbul is becoming known in the meeting and convention tourism sector as a destination on a global scale due to its numerous successes in hosting important events. Sun, sea, and sand destinations are all attractive sites for potential holidays in Antalya and the Aegean Sea coast, in addition to the 4-5 star hotels that comprise nearly half of all hotels in the Mediterranean basin. Even golf tourism is being developed in Antalya, and that is proving to be quite attractive for many. 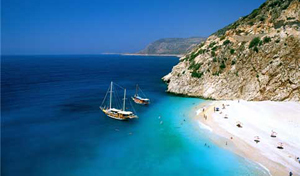 The sea-sun-sand geared tourism is still the strongest type we have in Turkey. Nevertheless, the tourism development strategy that is currently being implemented in Turkey takes into account the overwhelming amount of diverse potential in the country and the best way to utilize this varied potential, namely by prioritizing special interests, nature, the ecology, and convention tourism. This strategy places importance on collecting a larger share from the higher income earners in the country and attracting tourists from distant markets, and of course the US, as key aspects of the basic goals. As head of one of the Turkish tourism industry's leading civil society organizations, do you have a message for American consumers that we can deliver? It would truly be a loss not to visit a country with such an amazing historical legacy, rich cultural values, warmth and hospitality, the new and old together, and the successful and fascinating mix of tradition and modernity. I advise our American friends to ask trusted American friends and close ones who have visited the country to give their testimony as to all that they will gain by visiting Turkey.